Craig Elliott reckons Stockport County will win the National League North title, but he’s not planning on helping them. The Hatters arrive at the Jakemans Stadium tomorrow, knowing that three points would see them leapfrog leaders Chorley. But Boston are also desperate for a victory that could see them move to within three points of the play-off spots. “In my opinion, Stockport will win it,” said Elliott. “We don’t want to help them win it. We haven’t given up hope and we want to keep our season alive. With Chorley also visiting Lincolnshire this month, United could once again have a say in the title race, like last season when recording back-to-back victories against eventual champions Salford City and play-off winners Harrogate Town. “I think the good thing about this league, you don’t fear any game. 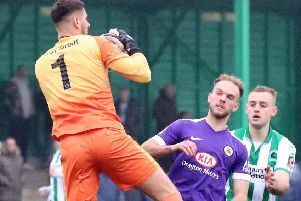 You see so many upsets,” added Elliott, who is expecting another physical challenge, like the one offered by Telford in the weekend’s 2-2 draw. “I think that’s the good thing about it. It’ll be a tough game and a chance to see how far off we are. “I think it’ll be similar. They’ve got a lot of similar qualities (to Telford) and it’ll be a similar match. Kick off at the Jakemans Stadium will be at 7.45pm.